Bad News for Outlaws: The Remarkable Life of Bass Reeves, Deputy U.S. Marshal by Vaunda Micheaux Nelson, illustrated by R. Gregory Christie. Grades 2-5. Carolrhoda Books, November 2008. Bass Reeves was born into slavery in the years before the Civil War and lived with Indian Tribes in Indian Territory until after the Civil War. When Judge Isaac C. Parker arrived in 1875 to bring order to the Indian Territory, Bass Reeves was hired as a deputy marshal to track down bandits, murderers, and other outlaws. Reeves served as a deputy marshal until 1907 when Oklahoma became a state and local lawmen took over. During his career, Reeves arrested over 3000 men and women. With his strong sense of right and wrong and his devotion to duty, Reeves did much to make the Wild West a safer place. Vaunda Michaeux Nelson won the 2010 Coretta Scott King Author Award for this title and now that I've read it I have to say that it was much deserved. I really enjoyed this book. 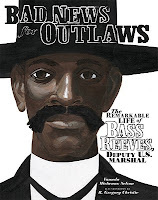 I had never heard of Deputy Marshal Bass Reeves before and now I'm so glad that I know his story! The format of the book serves its subject well. On some pages the text is incorporated into the full-page illustrations, but on other pages, it's printed on paper styled to look like Old West newspaper. It's a very effective way to give the reader an immediate sense of the time and place. Nelson starts the book with a bang, describing Reeves's showdown with outlaw Jim Webb. From there, she moves into biographical information and then she gives several examples of how Reeves brought in various outlaws. I have to confess that I am not the biggest fan of R. Gregory Christie's illustrations, but I will say that the colors he uses for this book definitely evoke the setting. Wide blue skies, green forests, brown fields... they all help to create the atmosphere of the West. This is a book that combines kid appeal with literary merit and you won't want to miss it. Add it to your Black History Month displays and units as well as your studies on the Old West. Check out The Brown Bookshelf's interview with Vaunda Micheaux Nelson and the Seven Impossible Things Before Breakfast's interview with R. Gregory Christie. Read more reviews at Through the Looking Glass Children's Books Reviews and Eva's Book Addiction. Happy Nonfiction Monday! Great Kid Books has the round-up this week, so go forth and learn! This sounds like a great read-I will have to add it to my school wish list! This book was missing from the book order I was cataloging at a library last week. I really want to see it.